When you see the Ipswich of today, you quickly forget its former drab appearance, since its overall character has changed greatly over the past few decades. 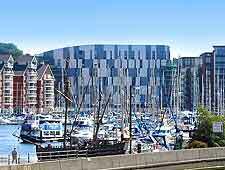 With modern shopping centres, such as Buttermarket and Tower Ramparts, and a revitalised Wet Dock quayside, which is now home to a stylish campus of Suffolk University, tourism in Ipswich has never been more apparent. 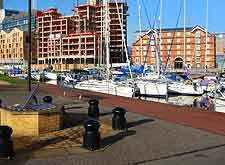 In the past, Ipswich has been an important centre for trading in both Saxon times and in the Middle Ages, and whilst it is the county capital of Suffolk, it is easily overlooked. As a result, the Tourist Information Centre on St. Stephen's Lane, next to Upper Brook Street and within the Buttermarket area, is actively promoting the town and its vibrant Haven Marina, Neptune Quay hotels, trendy waterfront restaurants and bars, medieval churches, Tudor buildings, beautiful parks and crowd-pulling summer arts festival - 'Ip-art'. 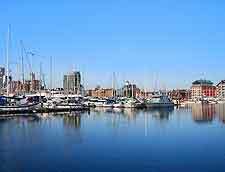 There are several different ways for tourists to sightsee in Ipswich, with walking tours led by knowledgeable Blue Badge Guides being particularly popular, along with summer tours onboard open-top buses. On a sunny day, a relaxing cruise along the River Orwell is something that should feature on everyone's itinerary, while by evening, the Regent Theatre, New Wolsey Theatre and Corn Exchange all offer live entertainment and performances. Families staying in Ipswich will enjoy spending time at the Orwell Country Park, or venturing just outside of the town to meet the friendly animals at Baylham House Rare Breeds Farm and also at Jimmy's Farm, which will be well known to avid BBC2 television viewers. And of course, who could forget the soccer fans, who come to Ipswich in their droves to support the town's famous team at their home ground, the Portman Road Stadium. 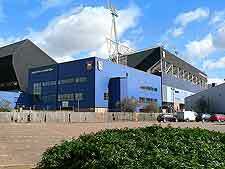 More information about Ipswich Tourist Attractions. 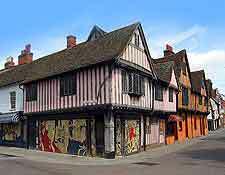 With so many listed buildings spread around Ipswich, the town is certainly not short of character. Proudly standing next to the Wet Dock, the Old Custom House dates from the early 1840s and dominates this part of the waterfront. In the town centre, the Ancient House is a familiar sight to shoppers and possesses a striking facade, embellished by fanciful plaster work. Close by and on Friars Street are two very different, contrasting Grade I-listed landmarks - the late 17th-century Unitarian Meeting House and the architecturally acclaimed contemporary masterpiece, the Willis Building. One of the oldest remaining buildings in Ipswich, and arguably the most beautiful, is St. Margaret's Church on Bolton Lane, which is known to have a history of more than 800 years. More information about Ipswich Landmarks and Monuments. Tourists looking to find out more information about the town's heritage will find a few museums that really do meet the mark. The Ipswich Museum on the High Street should be your first port of call, with its extensive archaeological artifacts, Suffolk Wildlife Gallery and Victorian Natural History Gallery. Completely different is the Ipswich Transport Museum at the Old Trolleybus Depot on Cobham Road, where historical horse-drawn carriages and electric tramcars stand side by side, all originating from this part of Suffolk. Another attraction for lovers of culture is the rather splendid Christchurch Mansion on Soane Street, which contains both a museum and the Wolsey Art Gallery. Continuing on the art gallery theme, the Town Hall Galleries on Cornhill may also be of interest to visitors. 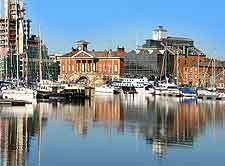 More information about Ipswich Museums and Art Galleries. Many tourists choose to stay in Ipswich due to its proximity to the coastline. Therefore, day trips the neighbouring seaside resorts of Clacton on Sea and Frinton on Sea are especially popular. Clacton on Sea is easily reached in 25 minutes by car and comes with a sweeping sandy beach, pier amusements and seafront promenade. 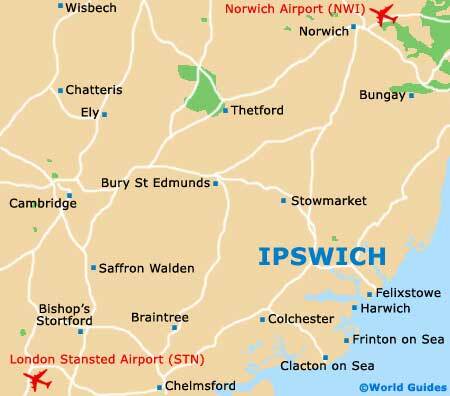 In the opposite direction, excursions to the westerly university city of Cambridge and historic market town of Bury St. Edmunds are both of note, as are trips to Norwich and the Norfolk Broads, which lie directly to the north of Ipswich. Further away and still easily reached by road or rail are the cities of London and Peterborough. More information about Ipswich Attractions Nearby.